Recipient of the USA Today 2014 Readers' Choice Award for Best Spring Training Facility, Charlotte Sports Park is a state-of-the-art facility with a baseball boardwalk ringing the outfield, family-friendly kids play area, upgraded concession stands and a top-notch team store. The Rays Inaugural Spring Training Season in Charlotte County in 2009 featured record breaking crowds, as the Rays set a franchise record for single-season home attendance. During the 2018 Spring season, the attendance record was broken for the largest single game crowd at Charlotte Sports Park. 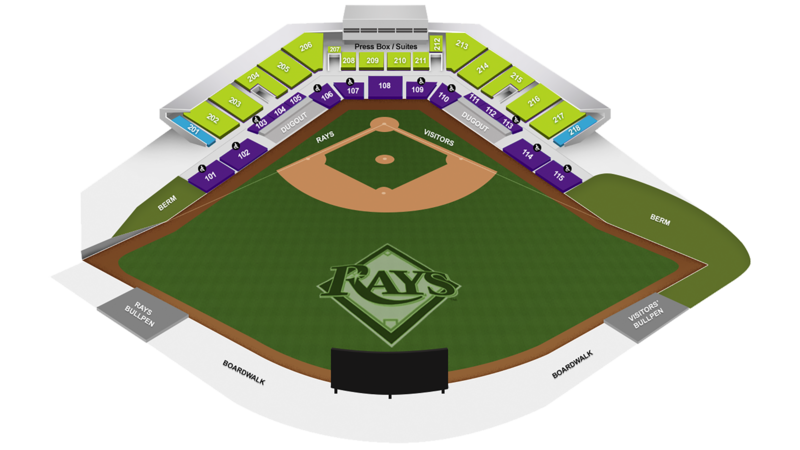 The Rays minor league affiliate, the Charlotte Stone Crabs, also call Charlotte Sports Park home. The Stone Crabs won the 2015 Florida State League Championship, have hosted an All-Star Game, and have earned multiple trips to the playoffs since their 2009 inaugural season. Quick Tip: For seats in the shade, pick the upper rows (200 seating). In 200 Level Seating, shade is typically rows 8 and above on the first base side, and the last three rows (14-16) on the third base side. For seats in the sun, choose seats in any lower section or head to the General Admission areas on the grass berms or standing room on the Baseball Boardwalk. Charlotte Sports Park is located on S.R. 776 which offers easy accessibility from U.S. 41 and I-75. In addition, this facility connects to Tippecanoe Environmental Park and will become the entrance to walking trails, a boardwalk and a canoe/kayak launch. Charlotte County, the Tampa Bay Rays and Charlotte Stone Crabs appreciate that all fans follow our Bag Check and Stadium Rules. Guests who choose not to adhere to these policies may be in violation of stadium or county regulations and are subject to intervention, including denial of admission into the stadium, ejection from the stadium, and/or arrest. Have FUN and CHEER for the Rays and Stone Crabs. Please be respectful of other fans' sightlines during play. Be aware of bats, balls or other objects leaving the field of play. Fans are responsible for ensuring their own safety when inside the stadium. Drink responsibly - consumption of alcohol by intoxicated guests will be handled in a prompt and safe manner. Consumption of alcohol by underage guests will not be tolerated. Observe all restricted areas including the playing field. The Tampa Bay Rays and Charlotte Sports Park are committed to creating a safe, comfortable and enjoyable ballpark experience for our guests. Our staff is attentive to the quality of your environment and is always available. We ask that you assist us by observing any prohibited items at Charlotte Sports Park to help ensure a family entertainment environment for all our guests. If any prohibited items are discovered at the entrance gates, you will be asked to return them to your vehicle or discard them. Prohibited items will not be stored at the gates or Guest Services. Please see Prohibited Items to help adequately prepare you for your trip to Charlotte Sports Park. We hope you enjoy the games. Get off at Exit 179 toward North Port/Port Charlotte, turn right on Toledo Blade Blvd, and drive 6.3 miles. Turn right onto El Jobean Rd/SR-776 and Charlotte Sports Park will be 2 miles ahead on the left. Get off at Exit 191 toward Englewood/North Port, merge onto River Road, and drive 5.4 miles. Turn left at Tamiami Trail South/US-41 and drive 6.2 miles. Turn right at Cornelius Blvd and drive 2.7 miles. Turn left at El Jobean Rd/SR-776. Sports Park will be a mile ahead on the right. Get off at Exit 164 to US-17 South to US-41 (Tamiami Trail) North. Turn left onto El Jobean Rd., and Charlotte Sports Park will be on the left. Through the Rays Baseball Foundation Spring Training 50/50 Raffle, one lucky fan at each Rays' spring training home game will walk away the winner of a cash prize. Fans may obtain 50/50 raffle tickets from uniformed raffle ticket sellers starting when gates open until the end of the sixth inning. No purchase or contribution necessary to enter or win. There is a suggested minimum donation to the Rays Baseball Foundation. The winning ticket will be announced during the 8th inning over the public address system. The winning ticket should be presented at the kiosk at the Home Plate entrance in order complete paperwork. Entrants need not be present to win. If winning ticket is not presented at the game, the ticket holder will have 10 days to deliver the ticket to the Rays Baseball Foundation. One winning ticket will be selected each home game from entries at that game. The winner will receive 50 percent of the gross proceeds from the game's raffle ticket donations that day, and the other half will benefit the Rays Baseball Foundation, proving summer camp scholarships for Charlotte County students. All expenses associated with the raffle will be borne by the Rays Baseball Foundation. See raffle rules and regulations.